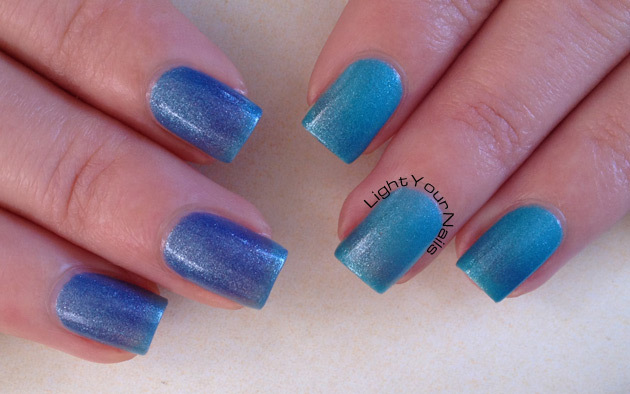 BornPrettyStore Color-change Polish n. 110 | Light Your Nails! E' quello il bello secondo me! ...bello questo smalto...mai provati smalti termici...sarebbe bello mantenesse la sfumatura!!! Dovresti provare uno di quelli Layla che sono davvero ottimi! Il turchese è tra i miei colori preferiti ma in questo caso non mi conquista per la fase scura! Yes, I like when they stay together in two too. It's a nice polish. Very nice color change. I have from this collection the green one, but the color change is not so obvious. I tried it when it was extremely hot, maybe the weather was not proper for it! Oh that sure didn't help! Penso che tu sia l'unica!! wow. Just...holy cow. These are positively luminous. I love when polishes are in the transition phase too! Yeah, I mean that's the idea right? This is very pretty but I'm like you, I like when it's in it's transition state on the nails. That's a gorgeous thermal! I love when they have a shimmery finish :). The finish was super pretty, I agree! I think Autumn and Spring are best, it can get too cold in winter and never change! It's a beautiful thermal, but too bad that it doesn't stay in transition state! This is gorgeous! Yeah thermals stay perpetually "warm" on me, so I always wish that they stayed in "transition" longer. It's the opposite for me! I always have super cold hands so it rather stays on the colder phase all the time! I really like this in the dark state but was a little underwhelmed in the light state. I think I expected them both a little "more". I'm with ya, love the transition state so it's a shame it doesn't linger longer in that zone. But it's a beautiful shade! Kind of a bummer that it doesn't ever stay in a transition state, but it is seriously pretty nonetheless! Pretty! I've still never tried a thermal polish, if you can believe it! Ouch! You have to, Katherine!